The Russian-American crew living aboard the International Space Station welcomed the safe arrival of a cargo-delivery tug Sunday, two days after the freighter aborted its initial rendezvous and sailed by the orbiting complex. Flying smoothly on autopilot 220 miles above Earth, the Progress M-06M spacecraft linked up to the aft docking port of the station's Zvezda service module at 12:17 p.m. EDT. "Docking confirmed...at the four-corner border of Russia, Kazakhstan, China and Mongolia," NASA commentator Rob Navias announced from Houston's Mission Control Center. "The belated arrival of the Progress 38 cargo ship executed perfectly, flawlessly by the KURS automated rendezvous system." Hooks and latches were engaged a few minutes later to firmly secure the 24-foot-long craft to the station, finally bringing two-and-a-half tons of supplies and equipment to the outpost. The Expedition 24 crew of commander Alexander Skvortsov, Russian cosmonauts Mikhail Kornienko and Fyodor Yurchikhin, and NASA astronauts Tracy Caldwell Dyson, Doug Wheelock and Shannon Walker plan to open hatches and enter the Progress around 3:30 p.m. EDT. The cargo includes 2,667 pounds of equipment, food, fresh clothing, life support system gear, 1,918 pounds of propellant to replenish reservoirs that feed the Russian maneuvering thrusters, 220 pounds of water and some 110 pounds of oxygen and air for the station's atmosphere. The Progress was launched Wednesday atop a Soyuz rocket from Baikonur Cosmodrome, reaching a preliminary orbit of 150 by 120 miles. A series of precise engine firings over two days guided the craft toward its planned Friday rendezvous. But an apparent interference problem about 25 minutes before docking halted the scheduled intercept and caused the freighter to move past the space station in harmless fashion. The Progress went into the standby condition when the communications link between the ship and station was interrupted. Engineers later traced the interference to a television transmitter used in the backup docking equipment that is available for the cosmonauts to manually fly the freighter via remote control. The autonomous safety procedures aboard the supply ship worked as designed to abort the rendezvous since conditions exceeded pre-programmed commands. Subsequent testing of the KURS autopilot showed that system to be functioning properly, so Russian specialists uplinked plans for the vessel to perform maneuvers Friday night and Saturday to target a Sunday docking attempt. "Everything is going extremely well. The KURS automated rendezvous system reported by the Visiting Vehicle Officer to be rock solid and locked on," Navias said Sunday as the craft closed within two miles of the space station. After arriving in close range of the space station, Progress began a flyaround maneuver at 11:49 a.m. to get lined up with the docking port and then executed a roll maneuver to properly orient its forward docking probe with Zvezda. The station crew didn't activate the television transmitter this time and the interference problem wasn't repeated. A brief stationkeeping hold with about 600 feet between the freighter and station allowed Russian flight controllers to assess systems before giving approval at 12:06 p.m. to commence the 11-minute final approach. The ship's autopilot did its job and drove the craft down the corridor for a successful docking while traveling over Russian ground tracking stations. "No doubt a sigh of relief on the part of the Russian flight control team after Friday's events. Today went by the book, a smooth and uneventful approach and docking automatically," Navias said. 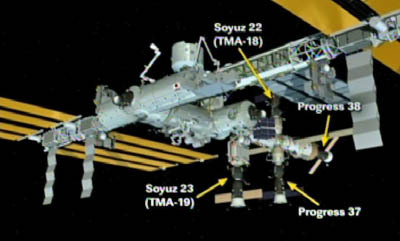 It is the 38th Progress to dock with the station over its decade-long life and the third of six scheduled this year. The craft joins the previous resupply ship that arrived on May 1 and remains affixed to the outpost's Pirs port, plus two Soyuz crew transport capsules currently residing at the space station's Poisk and Rassvet modules.